Some months back, I bored you in this “Something Thoughtful” spot with my accounts of various things my wife and I saw and did in Europe on a trip earlier this year. Visiting the van Gogh museum in Amsterdam, finding Hamburg haunted with ghosts, admiring the Venus de Milo, wandering through Montmartre cemetery, examining ruined monastery and castle in Yorkshire and so on. As always, encounters with strangers can be among the most interesting things in travel. But there was one encounter that was just a little unsettling. On our first day in Paris we wandered down the left bank, then crossed over a bridge to the Ile de la Cite and visited Notre Dame cathedral. There was indeed a long line of other tourists impeding our entry on this sunny spring afternoon, but the line moved quite smartly and we got in quickly enough, rejoicing that entry was free. This is a place of worship after all. (You do, however, have to pay if you want to ascend one of the towers and pretend you are Quasimodo). the cathedral’s treasures were clear. 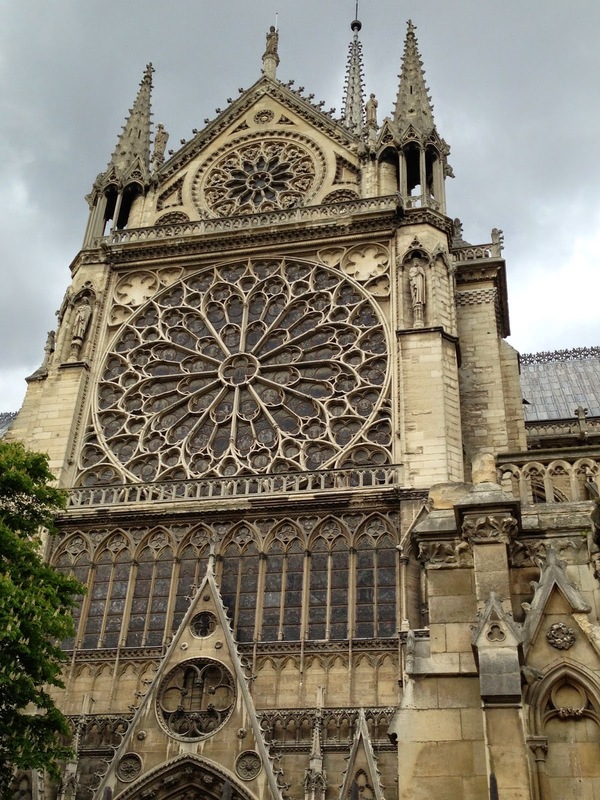 My phone camera clicked away freely, both inside and outside the cathedral, at the facade and the rose window and the flying buttresses and the long nave and the stained glass windows. Looking up that dark nave, I of course replayed mentally some of the moments in French history I’d read about that took place here. The old kings of France were never crowned here (that happened in faraway Rheims) but the pope did crown Napoleon here and I did remember, reproduced in documentaries, newsreel shots of De Gaulle attending a celebratory mass here in 1944 just after Paris had been liberated. Also, at the height of the revolution, the high altar was desecrated when the most zealous anti-clericals set up a statue to the Goddess of Reason. 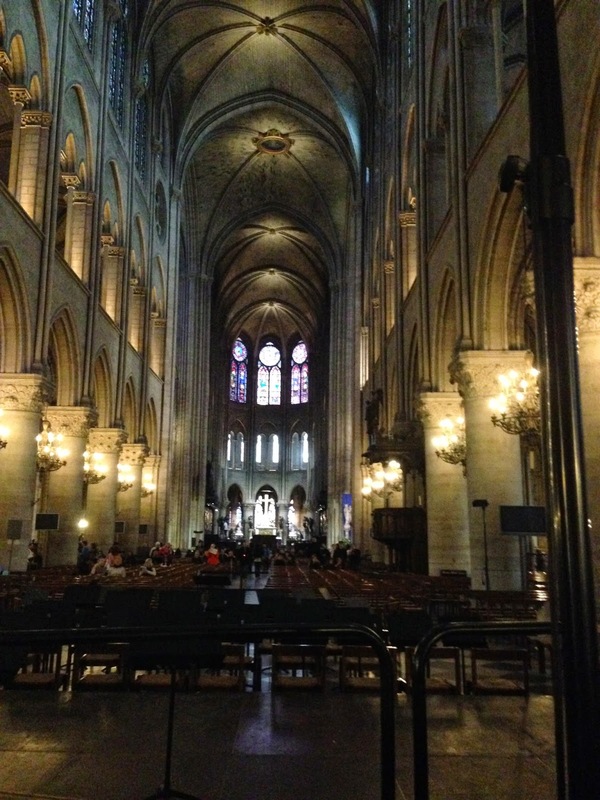 We wandered up the side-aisles, looking at the friezes and statuary and paintings and side-chapels and stained glass as intently as we could in the twilight of a large Gothic building. Then we were accosted by this odd and friendly little Frenchwoman. I would guess she was at least in her mid-seventies, but she could have been eighty. She appeared to be some sort of unofficial – and maybe self-appointed - guide. She wore a neat, trimly-cut dress and a badge. Perhaps she belonged to a church sodality. She was not a beggar. She did not ask us for money. But she did offer to “explain” things about the cathedral for us. 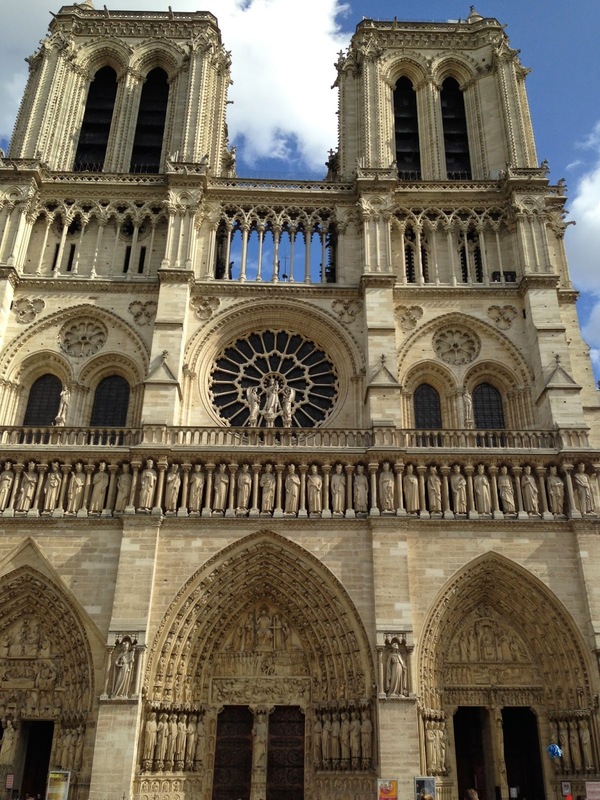 She began to “explain” how the side chapels were dedicated to various saints and how the cathedral was cruciform and I believe she would have told us what a nave and a transept were if she had not seen the looks on our faces, which presumably told her that we already knew this stuff. Most likely she was used to addressing heathen tourists who hadn’t a real clue about what a cathedral was. We had begun talking in French. She asked if we were “croyants”. I said, yes, we were, but noting how halting my French was, she switched to English. Her English was better than my French. She was bright, intelligent and clearly no fool. Then the business started, for presumably she now assumed that we, as “croyants”, would share completely her worldview. It was a pity that most people nowadays did not know anything about the church, she said. And it was a pity that so many young people ran wild and did not know anything about morality, she said. This time we agreed with only forced politeness, but she continued. France was now in a dreadful state, she said. It had been going downhill for hundreds of years, she said. I began now to sense where we were heading. Of course there are conservative old people in every land who mythologise “the good old days”. I knew that, though it is much more subsumed and muted now, and though much more immediate issues have overtaken it, there is still a cleavage in France between those who promote the heritage of the revolution and the secular state, and those who still hanker for the glories of the Catholic state that dominated Europe, bolstered by an absolute monarchy. Madame was obviously in the latter class. I thought she would now tell us about the horrors of the revolution and how the church was persecuted. But she didn’t. She said that the rot had begun to set in with King Louis XV decades before the revolution, what with all his mistresses and the type of people he had allowed to teach at court. Madame clearly disliked the Enlightenment and the France of Montesquieu and Voltaire and discreetly atheist clergymen under a complacent hierarchy as much as she disliked the Revolution and the France of Robespierre and Marat and Hebert and violent anti-clericals. The immorality and indifference of young people, she said. And the fact that the government was now thinking of attacking old people by not letting them have pensions at the age of 60. And then she added that there are now too many Muslims in France, and she seemed set on elaborating on this theme. At this point, as we agreed afterwards, we both felt that she had crossed a line. Madame was not only hankering for a Catholic France that didn’t exist anymore, but she was resentful of other races and cultures. Of course she was not alone in this. Remember, it is the government of a secular France which has forbidden outward cultural signs of Islam being displayed in French schools, and which clearly wants to “integrate” Muslims into French society on strictly secular French terms. Even so, from the way she now spoke, we wondered if our “guide” wasn’t in the Le Pen camp. 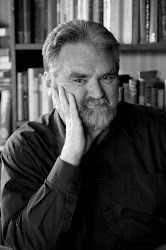 It is one thing to be harmlessly nostalgic about the historical past, but when that nostalgia turns programmatic and becomes exclusivist, it also becomes a major problem and a danger. So we thanked her and politely excused ourselves from her company. My wife made some tart comments on a nation that had got used to retiring on full pensions at the age of 60. Briefly, I wondered if our guide wouldn’t have been an anti-Dreyfusard one hundred years ago or a Petainist seventy years ago. I then thought, “That’s too harsh a judgment.” Hypothetical thoughts about what people “might have been” in other historical circumstances are always prejudicial. What I did think was how similar her mindset was to that of an old New Zealand-resident Englishwoman I once wrote about on this blog under the heading “Some Corner of a Foreign Field” (look it up on the index at right). The old Englishwoman had an idealised, nostalgic view of England as unreal and as prone to prejudice as the unofficial cathedral guide’s view of France. After we had left her, I was a little agitated. 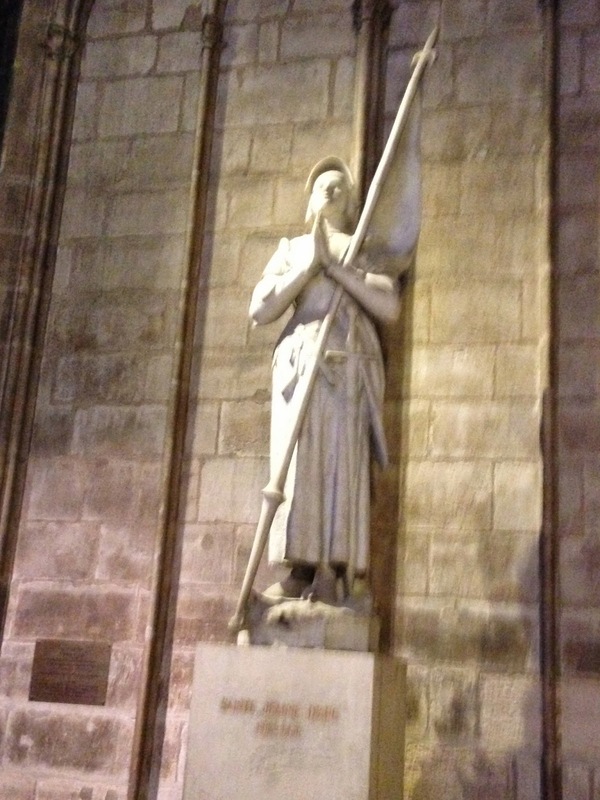 My hand shook when I photographed the cathedral’s statue of Joan of Arc, praying, eyes heavenward, her banner over her shoulder, her sword dangling at her side. I felt very ambiguous about Saint Joan. Personally, I like the story of the inspired peasant girl who trumped an English army before being martyred. It is perfectly reasonable that she is a symbol of French nationalism. But I was also aware that under her banner there has developed the sort of nationalism which confuses national feeling with religion, and reduces Christianity to a national cult like the Church of England. I may be “croyant”, but I am not that sort of “croyant”. For a Christian, nationalism should stand quite a few paces behind Christianity, and church and state should keep a proper and wary distance between each other. Otherwise you have Gallicanism. Or Anglicanism. However much it may bind and inspire people in times of war, the cult of the nation is not to be confused with religious belief. Hi Nick, interesting post. I stood in front of this very same statue last year and felt that she was in her rightful place. She, the most documented of the medievals, records a piety and trust in God that all of us could emulate, and her compassion even for the english "enemy" as recorded in her letters could teach that old lady a little as well. I find it endlessly facinating that the Catholic church, while rightly rejecting the deification of nationality, by recogniseing her as a genuine seer, implicitly witnesses to the idea that God takes a very real interest in geo-politics. I have heard one theory that this seeming divine partiality toward the french cause on the 1400's could be explained by the potential influence of future-protestant Britain on a subjugated Catholic France, if Joan had not prevailed?? Away from the vagaries of counterfactual history though, Joan stands out as a shining light of courage and humility in an age dominated by pride and cowardice.